That’s “imputation,” not “amputation.” 🙂 It’s not a common word, so I’ll try to explain what it is, and what it has to do with our salvation. I said a few days ago I wanted to sharpen our thinking on aspects of the doctrine of salvation, and wrote on the basis and cause of condemnation in relation to our pardon. This post looks at some of how it works, as revealed in Scripture. A formal definition (Cambridge Dictionary) is “to say that someone is responsible for something that has happened, or that something is the cause of something else.” This modern non-technical usage differs little from “attribute” — saying something good or bad about a person. To “attribute motives” or “impute motives” is to say that you know what their motives are. “Imputation” has technical meanings in statistics and modern law, but perhaps it will help to think of it as similar to an accounting term as we look at the way the Bible uses it. Something “imputed” is credited / charged to your account. This is not always understood by believers, but a wonderful aspect of our salvation is that the righteousness of God is credited, or imputed, to our account when we trust in Christ. This verse says God’s righteousness is not only “to” those who believe, but “upon” them. The righteousness of God was put on us when we trusted in Christ. Trying to earn righteousness will never work, but belief is counted for righteousness, and God imputes (credits) righteousness to us. The previous chapter tells us which righteousness this is — the righteousness of God. Sometimes, believers think that Christ’s work can be summed up as removing our sin, but it is more than that. “Who” in this verse refers to “him” (if anyone wants grammatical details I can explain in the comments). Jesus, who knew no sin, took our sins so He could take the punishment for them, and His righteousness is put on us. It is a straight-across transaction, sin for righteousness — but the righteousness of Jesus was more than just the absence of sin. Jesus did not merely avoid breaking the Old Testament Law, He completed the fullness of it. He completed every righteous requirement of the Law. This brings us to another verse which is sometimes only partially understood. Here, Jesus is talking about baptism, but expands to a larger principle. He came to fulfil all righteousness, not just the Law, but baptism and all other righteousness as well. His righteousness covered all the bases, not only avoiding every evil thing but completing every good thing — and it is credited to us. This clears up another misunderstanding some have. You don’t need to be baptised or circumcised or keep the Law to be saved — but you do need the righteousness of baptism and the Law. (If you think I just contradicted myself, read on. :)) Jesus fulfilled all, and His righteousness is credited to us by faith. You need that credit. If you have trusted Him for forgiveness and righteousness, you possess the righteousness of the Law, of baptism, of every good thing. You either have all the righteousness He gives, or none of it. That’s a good thing, because our righteousness isn’t very satisfactory to God. Our righteousnesses are weak and pathetic and dirty in God’s eyes — but He isn’t looking at them, in the case of believers. The transaction was made, the righteousness of God has been imputed. It’s impossible to be partially righteous, because you either have only “filthy rags” or you have the fully given righteousness of God. This zaps pride. Think you are pretty good? God calls it “filthy rags” — worthless. The only righteousness that is worth anything is worth everything. There’s no difference between us — we all sinned, we’ve all been given this righteousness of God. Imputed righteousness makes pride ridiculous — you aren’t better than someone who has the righteousness of God! There aren’t good Christians and bad Christians, there are righteousness of God Christians and false Christians. 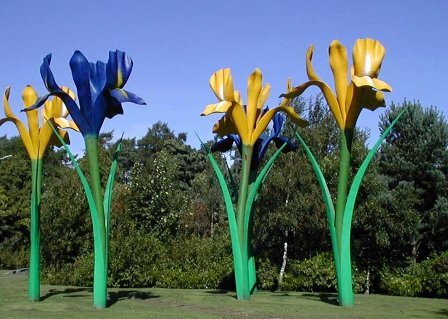 Suppose I take Leslie Roundabout too fast, and the car rolls between the giant irises, and burns. The fire spreads rapidly. Forester’s Lodge, across Western Avenue in Balgeddie and Whinnyknowe, everything burns. Nine hundred homes gone, thousands homeless, hundreds of millions of pounds of damage, and it’s all my fault. I’ll never be able to pay what the insurance companies will want from me. It’s beyond anything I could ever cover — it might as well be an infinite debt. Suppose a kind billionaire (anyone know one? :)) hears about it and sends a cheque to pay the debt I never could have paid. It won’t be imputed / credited to my account unless / until I believe it and take it to my bank, but once I do, I can pay the whole debt. That’s similar to, but less than, what Jesus did. He not only wiped out our immense debt of sin, He gave us His righteousness. It’s as if the billionaire said, “By the way, you are my heir. You’ll receive the whole lot soon — but for now, I put so much in your account that you’ll always have enough.” The debt is gone, and the wealth of the righteousness of God is in our account. That will always be enough. This is the other side of it. If you’ve never trusted Christ for cleansing, forgiveness, and righteousness, if you’ve never been born again in Christ, another imputation takes place. Iniquity / sins are imputed, too. Imputed righteousness is an undeserved free gift, like the billionaire’s gift. This imputation is deserved — for those whose sins are not forgiven, their own sins are imputed (charged) against them. By faith we receive the gift of God’s righteousness credited to our account, and move from immense debt to immense wealth. Without faith, the Righteous Accountant enters our sins on our account — and one day, the books will be opened by the Righteous Judge. Imputation happens in every life — imputation of sin, or of righteousness. Your sin (and its fitting condemnation), God’s righteousness (and life) — one (and only one) will be imputed. Something goes on your account, something will be written. This entry was posted in Grace and Forgiveness and tagged condemnation, Forgiveness, Imputation, righteousness, sin. Bookmark the permalink. God’s Word to us is so wonderful! Too often we skip over words like imputation without ever having even the smallest glimpse of who God is and what He’s done on our behalf. Amen. It is good for us to step back and see the overview, so we don’t miss the forest for the trees, but it is also a blessing to look closely at the details of His truth.